Homeopathic prophylaxis is the use of potentised remedies in a systematic manner to prevent development of the characteristic symptoms of a disease. HP instills natural immunity by stimulating the immune system with an energetic remedy which matches the vibrational energy of a given disease. On exposure to the disease, the Vital Force is primed to react with a mild or asymptomatic version of the disease. How long has HP been in use? Homeopathic prophylaxis, was first introduced by Dr Samuel Hahnemann in 1798, two years after Edward Jenner’s famous smallpox vaccination. In aphorism 73(b), Hahnemann describes how he successfully uses Belladonna as a preventative remedy in an epidemic of Scarlet Fever which was often mistaken by physicians of the day with Purpura Milliaris, a sporadic acute disease that he would typically cure with Aconite. He suggests that some acute epidemics are acute miasms which “recur in the same manner and are therefore known by a traditional name”(2) e.g. Scarlet Fever. In a subsequent outbreak of Scarletina, Hahnemann identified Aconite as the common similimum. HP involves identifying the similimum of an outbreak of disease, selected from the common totality of its symptoms, and their similarity to the symptom picture of the remedy. This remedy is known as the Genus Epidemicus (GE) and is administered to those in contact with the disease. Different epidemics of the same disease didn’t always have the same GE, and occasionally an epidemic had more than one GE. More recently, another method of Homeoprophylaxis has been widely used, involving the use of nosodes – remedies derived from diseased tissue. Nosodes represent the generic appearance of the acute condition, not allowing for individual variation, and are useful in the early stages of an outbreak before the G. E. has been identified. What are the disease prevention alternatives available today? There are two methods of disease prevention; Homeopathic Prophylaxis and Vaccination, neither of which are 100% effective. The most effective method of disease prevention is previous exposure to that disease, however even this is not infallible. 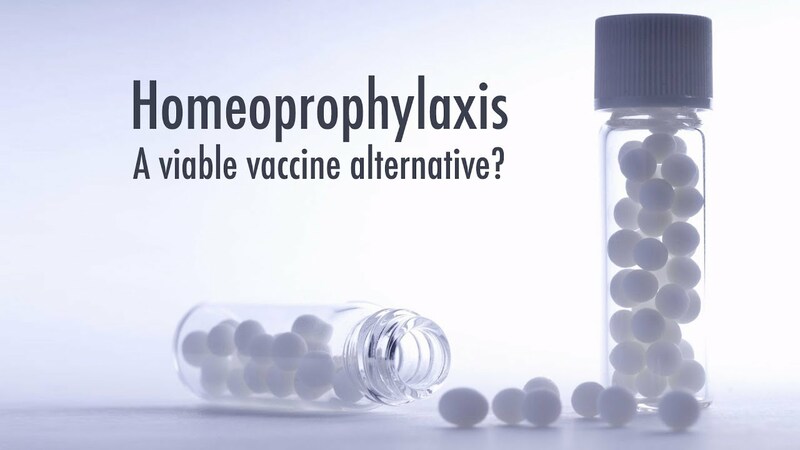 Homeoprophylaxis is concerned with immunisation, as distinct from vaccination; the remedy educates the Vital Force to resist a specific disease by introducing its symptom picture prior to exposure. In this way the organism is primed to defend itself from the pathogenic attack by altering its susceptibility prior to infection. Both remedy and disease exert their influence on the organism dynamically. Vaccination involves the introduction of an attenuated pathogen in order to stimulate the production of antibodies. The production of antibodies is considered to be equal to disease prevention. These mechanisms typically by-pass the natural portals of infection (the nasal passages, skin, mouth and mucosa), and the body’s natural responses. The normal processes of illness; the inflammatory response of fever, rash etc and the eliminatory mechanisms of cough, sweating, diarrhoea, vomiting etc. are the body’s natural methods of clearing bacteria and viruses from the system. Immunologic ‘memory’ is employed in lieu of these natural processes. Natural Immunity is acquired from contracting the disease which sensitises the antigen-specific Memory T-cells in the immune system via an elaborate system of co-operation with other cells. These go on to divide and proliferate and provide cell-mediated immunity by responding rapidly to any future encounter with the same antigen (4). This kind of immunity is statistically the most reliable and can be passed on to future generations through placental tissue and breastfeeding. Childhood Diseases such as Measles, Mumps, Rubella, and Chickenpox form a category of diseases which have afflicted children for generations, and which are normally benign conditions associated with maturation of the immune system. They necessitate a certain period of isolation which can be inconvenient, but otherwise generally cause little trouble in a well nourished healthy child. The disease sets them up for life-long immunity and primes their immune systems to react effectively to other acute infections. Studies show that childhood infections can protect against allergies as well as eczema and asthma (3/92). It is a common observation that children emerge from these acute episodes stronger and with more vitality, often producing an impressive growth-spurt in their wake. Fear – Persuasive doctors often exploit the parent’s natural desire to protect their children by exaggerating the dangers of these typically benign or extinct illnesses. Doctors are incentivised by the vaccine manufacturers to achieve targets and often omit to inform parents about the safety and efficacy of their vaccines. Conformity – it is a system you have to proactively opt out of rather than opt in. Many parents will be unaware that they have a choice. In some western countries vaccinations have become mandatory. Pressure – from the medical profession or other parents to do ‘the right thing’. Herd Immunity – Requires 68% of a population to be unsusceptible. Immunologist Tetyana Obukhanych dismisses this concept. She says that due to the short-term protection of the vaccines and their concentration during childhood, herd immunity will never be achieved even in the post elimination era, because the 1-18-year age group will never amount to 68% of the entire population. She says the absence of major viral epidemics is down to the lack of endemic viral exposure, not herd immunity.(1). Convenience – Busy parents are often unable to take the necessary time off work and consequently the idea of prevention is very appealing. Prevention – There are many illnesses which it is not desirable to contract in the name of ‘natural immunity’. Health status – how many of us can claim to be healthy enough to withstand the assault of these diseases on a standard western diet/lifestyle? Vaccination V HP – Are they Safe and Effective? No lifelong protection – immunity is short term. The implications of this regarding childhood diseases is that immunity wears off after childhood, leaving the adult susceptible. Whereas these diseases are typically benign in childhood, they can be more serious when contracted in adulthood. For example, a possible complication of an adult male contracting mumps is infertility, and if a pregnant woman becomes infected with German measles, there is a risk of deafness to her unborn child. The vaccination serves to move susceptibility to a more vulnerable age. Lack of safety testing – Randomised Control Trails (the scientific community’s gold standard of testing) would involve the exposure of a control group to the disease and are therefore considered unethical. Where studies exist into vaccine safety, data is often withheld or manipulated making them unreliable or demonstrating scientific malfeasance (M/43). False data – Statistics used to justify vaccination are dubious. Historically many vaccines have been introduced after a long and sustained period of natural decline of the disease. When this trend naturally continues, the vaccination wrongly gets the credit. False assumptions – Vaccination theory is based on the assumption that antibody production is the same as immunity. As long as there is evidence of antibody production, immunity is assumed. Tetyana Obukhanych suggests that antibodies produced from Toxoids (pathogen + adjuvant) are not the same as those produced by the antigen alone. Any questioning of existing immunological theory is positively discouraged (1). Side Effects – These are common and well documented and range from mild skin symptoms to death. One of the most damaging aspects of vaccination is the adjuvant component, designed to magnify the efficacy of the vaccine by boosting antibody production. Aluminium in particular is a neurotoxin and can destroy neurons which are necessary for the proper functioning of cognition and movement. It can also travel to other organs and cause autoimmune diseases, inflammatory responses and disorders of the central nervous system. Aluminium has been linked to the high rates of autism in children in the West. (5/45) Mercury, in the form of Thimerosal, is added to prevent contamination of multi-dose vials of vaccines. This has been linked to neuro-developmental problems including retardation and autism. It has been removed from most vaccines although it is still used in the Influenza vaccination and is extensively used in developing countries by the W.H.O. due to the reduced cost of producing multi-dose vials (5/20). Reporting – There is a three-week window for reporting adverse effects. Long term effects are rarely attributed to the vaccine. What little data is available would suggest a strong link between vaccination and the significant rise in chronic disease (3/119). Indemnity – Pharmaceutical companies are immune from prosecution in the event of vaccine damage and in many cases conduct or fund their own research. Trade off –A reduced risk of contracting specific diseases is replaced by an increased chance of acquiring a neurological or auto-immune disorder. Unintended consequences – studies show that annual vaccination against seasonal influenza reduces protective immunity against more virulent pandemic strains (5/64). Unvaccinated individuals are likely to gain ‘cross protection’ from their exposure to the many circulating viruses. Vaccine Infection – Historical cases document instances of live virus vaccine causing the disease it is supposed to prevent, and in the process, exceeding the likelihood of contracting the ‘wild’ virus by a considerable margin (1). The acellular pertussis vaccination has shown itself capable of infecting susceptible (unvaccinated) individuals with the virus (5). Strain replacement – vaccines can encourage the emergence of other strains of a disease as they replace threatened ones. Often these strains are more virulent, as in the Haemophilus influenzae virus which causes middle ear and respiratory infections, and bacterial meningitis. they meet resistance in the form of a vaccinated population, they must increase their virulence in order to survive. When the ‘b’ strain (Hib) was addressed the ‘a’ strain (Hia) infections increased in number and severity. Vaccinating children against chickenpox increases the risk of shingles in teenagers and adults. Efficacy – There have been many outbreaks of diseases such as Measles in fully vaccinated populations. Officially effectiveness varies between 40.6% (6) and 95% depending on the vaccine being studied. Australian Dr Isaac Golden is the present-day authority on Homeoprophylaxis and the author of the largest long-term study into its safety and effectiveness. He concludes that reactions occur in less than 2% of doses on his programme (3/55). He goes on to say that the reaction to HP is never toxic and the disease can never be contracted from the remedy. He advises parents and patients to allow reactions to resolve without interference, if possible, as the reaction provides evidence that the remedy will confer the best protection. If the reaction cannot be endured, it is always possible to antidote the remedy. According to Dr Isaac Golden there is much clinical evidence of the efficacy of HP, however much of it has not been formally collated for statistical analysis. There is extensive historical evidence that HP was used successfully by many of the old masters, including Hahnemann himself. In his ‘Complete Practitioner’s Manual of Homeoprophylaxis’ Dr Isaac Golden published the results of six trials into five epidemics (Scarlet Fever, Smallpox, Influenza and 2x Meningitis) which took place from 1853 to 1998 (3/62). They demonstrate effectiveness of 92.9%, 97.5%, 86%, 86.1%, 92.4% and 91% (Average 91%). Dr Isaac Golden undertook a fifteen-year clinical study (three groups of five years) into children who had used his own program, however he criticises his own scientific rigour for the absence of a control group. He points out that the effectiveness of the protection can only be compared to the natural incidence of the disease in the susceptible population. I would add that his research into his own program can hardly be described as independent. The conclusions of his research were that HP showed a ‘consistent level of effectiveness of around 90%’. If reliable, this compares favourably to vaccination. Reactions occur in about 2% of doses and are typically brief and mild. His research findings also demonstrate the long-term health benefits of following an HP program; long-term studies into the safety of HP suggest an inverse association between HP and asthma, eczema, allergies and behavioural problems(3/92). Some homeopaths oppose the long-term, non-epidemic use of HP on the grounds that it disturbs the energetic health. They believe a remedy should only be used when it is indicated by symptoms. Dr Golden likens the process of HP to that of provings where healthy people take a remedy in order to establish its therapeutic action. Hahnemann stated that participating in provings was a way to enhance health. Dr Golden claims to minimise the risk of ‘dynamic damage’ by spacing out doses over long time frames and instructing clients to stop the remedy if reactions occur (3/101). Homeopathic remedies are sensitive to antidoting, so it is imperative that the person administering the remedy follows strict procedure with regard to storing and giving the remedy. In the event of an ‘accidental’ antidoting of the remedy, it would be impossible to tell that the remedy had been antidoted, it simply would not work. Some practitioners insist on administering all the doses at their clinics which would minimise this risk, however this puts their programs out of reach financially for many families. HP program makers do not agree on the physiological action of the remedy. Kate Birch and Cilla Whatcott from USA, claim that the remedies provoke antibody production, however Dr Golden suggests that this is not the case nor is it the aim of HP, and that antibodies do not equal immunity (3). Currently there is no way of knowing, other than by exposure, whether there is susceptibility to a particular disease. The protection conferred by both methods is comparable, however, HP being non-toxic has many fewer adverse reactions which are consequently milder. There needs to be much more research into this area of medicine, including Randomised Control Trials where possible. As suggested earlier, many alternative practitioners would question the necessity for immunity to the childhood diseases, however, as many parents feel compelled to protect their children from them, it is important there is a non-toxic alternative. It has to be said too that these diseases are not always benign. They can sometimes provide conditions for chronic symptoms to develop in their wake. Homeopaths frequently see these ‘never been well since’ (a certain disease) cases in clinic. There are many HP programs available and each is dependent on the diseases the child is likely to be exposed to. They can be tailored to the specific requirements of parents and are administered according to a specific schedule often by the parent themselves. HP was used extensively in the 1800’s across Europe to prevent diseases such as cholera, typhoid, diphtheria, poliomyelitis and scarlet fever. Its success in preventing disease ensured its rapid spread across the world. Below are a few examples of its use by governments in epidemics. Dengue Fever Outbreaks – Brazil (2001), Cuba (2006) and Brazil (2008). All reported statistically significant results. Meningococcal disease (2001). 65,826 0-20-year olds were immunised homeopathically while 23,532 were not. Over a year 4 out of the homeopathically immunised group contracted the disease compared with 20 out of the ‘control’ group, showing 95% protection in the first 6 months and 91% for the year (7). Made from natural substances and therefore cannot be patented or restricted for profit or political gain. In some diseases a vaccination has not been developed, so HP is the only preventative. In conclusion, there is plenty of evidence to support HP in all of its applications, though more is needed to convince the sceptics. The obvious economic benefits have seen HP widely adopted in developing countries where the data collected is providing some valuable empirical evidence. In the developed world the pharmaceutical companies have the monopoly and their large profit margins make them aggressive in their defence of it. Where vaccination is mandatory, such as in some states in the US and Australia, there is much suppression of information which criticizes vaccination and/or promotes HP. Much of the information online is watered down and comes with a disclaimer due to the likelihood of litigation. Hopefully soon everyone will be fully informed and able to choose their preferred method of disease prevention.